SECTION 15! EXTRAORDINARY 3/2/2 POOL HOME ON APPROX. ACRE WITH SEPARATE 4-CAR GARAGE! Room to store your boat and all your toys to enjoy all the amenities SWFL has to offer. Open floor plan with double door entry, formal dining/living room, cathedral ceiling, surround sound and diagonal tile flooring throughout main living area. Beautiful kitchen with custom tile insert, raised panel cherry wood cabinetry, granite, tile backsplash, stainless appliances, breakfast bar, pantry with soft-close drawers with pullouts and casual dining area with aquarium window overlooking pool. Engineered hardwood flooring in family room and all bedrooms. Master bedroom with his and hers walk-in closets, French doors, and private ensuite with double vanities, jetted soaking tub, custom tile walk-in shower. Two guest bedrooms, separate full guest bath with beautiful cabinets and granite counter top and large utility room with deep sink and extra storage. Expansive outdoor entertaining area features covered lanai with vaulted ceiling and tile flooring, screened heated freshwater pool with waterfall features, cool deck and child safety fence. Double lot with huge back yard with storage shed and fence for privacy. 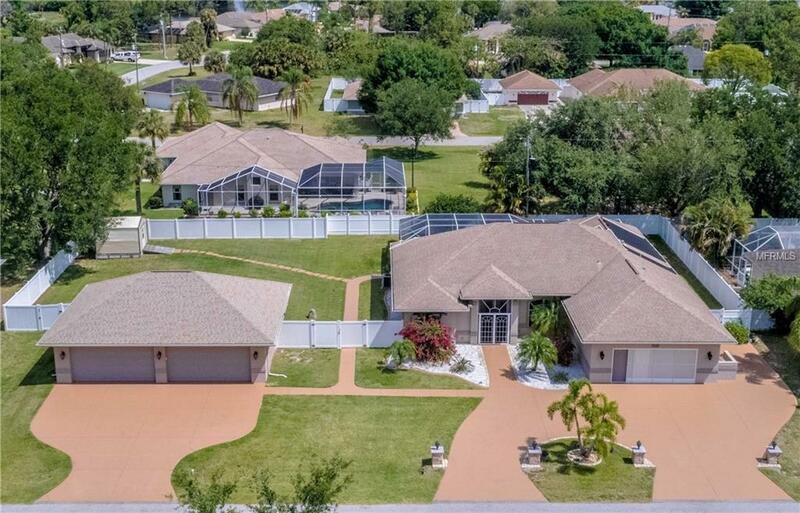 Meticulously maintained with amazing curb appeal. Huge 4 car garage with ceiling fans and plenty of lighting to work on any project. Not one detail overlooked! Great location minutes to I-75, restaurants, shopping, parks and all amenities. CALL FOR YOUR PRIVATE SHOWING TODAY!